Elizabeth David. 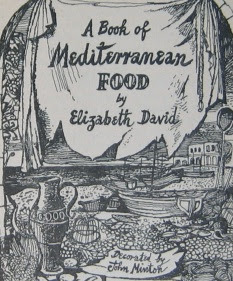 A BOOK OF MEDITERRANEAN FOOD. John Lehmann Ltd. London, 1950. A breakthrough book. A great and influential book acknowledged now by many celebrated cooks. Unashamedly literary 'A Book of Mediterranean Food' stills stands up today as an inspiring collection of recipes from France, Italy, Spain, Turkey, Greece and Egypt. Best of all they can be cooked from, something not always true of recipes. Alice Waters, of Chez Panisse, said "When I go back and read her book now...I feel I plagiarized them. All of it seeped in so much, it's embarrassing to read them now." Even Jamie Oliver pays homage to her and the food at the River Cafe where he started was partly inspired by her cooking. VALUE? A difficult book to find as a true 1950 first in its colourful John Minton 10/6 jacket. I have seen copies as much as a thousand pounds but certainly a decent clean copy with no chips to the jacket would be catalogued at £500. Used copies in slightly worn jackets can be had at around £300. Even sans jacket it can make just over £100. In 1987 Dorling Kindersley put out a signed limited edition of her 'French Country Cooking' limited to 450 signed copies, this can command £200+ and seems unaccountably scarce- presumably it was bought at the time by well heeled foodies and they are jealously holding on to it -such is the reverence that Elizabeth David inspires. I work with them, so I have the inside scoop, but these videos and meals are great and a lot of fun for us foodies! Not entirely without interest although as I recall Elizabeth David never used spam in her cooking...Rocco di Spirito see you next Tuesday! George Orwell. Animal Farm. 1945. Gerald Kersh. Jews Without Jehovah, 1934. Ed Ruscha. Royal Road Test 1967.